We all in 2013 are convinced that a good online presence is as needed for a businesses to exist and grow as sunlight is needed on Earth for the flora and fauna for the same reason. Every business big or small is struggling to achieve a good online presence and trying out various online platforms to put their best foot forward. The integrated use of the paid media, earned media and owned media are the 3 main routes to overall web presence. The customer’s online journey is getting increasingly complex with the emergence of new devices, media and new technologies. The intersection set of earned , owned and paid media is what gets the business owner the maximum benefit. Valuable informative content is at the crux for establishing an online thought leadership and creating the trust for any brand. Content Marketing is an online strategy which helps the brand to harness the benefits of all the earned, owned and paid media and dive into the sea of online opportunities. The SEOs today are leaving no chance to call Content Marketing as the New SEO but, this statement is as misleading like the statement “Link Building Is SEO” was when black hatters resorted only to link building as SEO when PageRank Technology was implemented by Google. In 2013 SEOs have to think from a wider perspective because, when we speak about the convergence of the earned, owned and the paid media we are referring to the web as a whole and not only to the search engines. Content marketing is a good SEO strategy but it is not the new SEO. Today a true SEO does not limit herself only to Google Algorithms but looks beyond and thinks about how a website can adapt to the web standards which are applicable and integrated by search engine algorithms as of now and also works on the standards which have a potential of being integrated by search algorithms in future . This does not only ensures a long term good health of the website but also makes it prepared to face any algo updates without getting adversely affected. Search engines are not the WWW. They are a subset of the WWW superset. Search engine algorithms try to get quality signals from the web and constantly endeavour to improve the search results so that they can cater quality search results to the user. Instead of running after the algorithmic updates and changes if we as SEOs focus on what makes the web a better place and implement the quality factors on the websites as per web standards then we can be prepared before the search engines use them in their algorithms. But, it is in 2012 when Google launched the Knowledge Graph that the SEOs started focusing their attention on microdata. Why did SEOs wait for Google to add structured data to WMT and in their algorithms for it to be called it a standard? Microfromats was already a standard in early 2000 but Google was able to integrate it to its algorithms partially only in 2011. Whether it is your website or the social media presence all the platforms have a web standard to adhere to, I think we should not wait for the search engines to integrate those standards to start using them but logically implement them as we make our online presence felt on that platform. W3C laid the foundations of today’s Web with standards such as HTML (in 1997) and XML (in 1998). 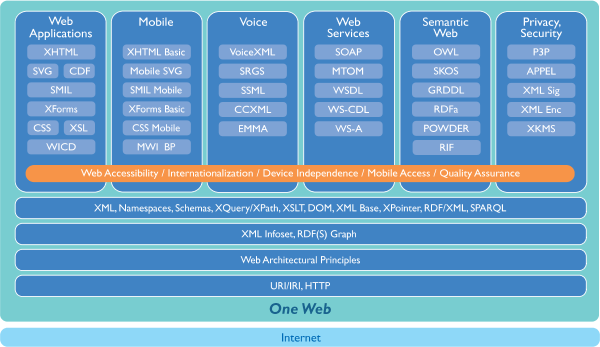 The figure below shows the large number of forward-looking W3C recommendations that emerged from these earlier technologies, and shows the organization’s current focus on device-independent data and the promise of a “Semantic Web”. Efforts to achieve the “long-term growth for the Web” that is enshrined in W3C’s mission statement, are today guided by the principles of “accessibility, internationalization, device independence, mobile access and quality assurance”. In the orange bar of the figure below, these priorities underpin W3C technology recommendations that include standards such as Extensible HyperText Markup Language (XHTML) and Cascading Style Sheets (CSS), listed under “Web Applications”. Google in order to get complete social signals data introduced the Google+ social media platform and has integrated authorship markup and local search such a way that everyone is compelled to have a Google+ account if they want to keep their search presence alive. For this change of approach the SEOs also need the support of the website owners who need to accept that SEO cannot be considered purely as advertising but need to accept that SEO means making your site so robust technically that when the search engines trying to crawl and index the site it is able to do so and extract the relevant data despite the frequent algo quakes by the search engines. Just like a good engineer applies scientific, economic, social, and practical knowledge in order to design, build, and maintain structures, machines, devices, systems, materials and processes. A good SEO needs to apply technical specifications that define and describe aspects of the World Wide Web which directly or indirectly affect the development and administration of web sites and consider include the interoperability, accessibility and usability of web pages and web sites from the WWW perspective. Instead of understanding what Google wants, we need to understand the standard norms of web design and development which will make the web a better place and websites robust technically. Only when the website, the social media accounts and the paid media are following the ethics and the science of the WWW the web presence will get the needed visits, mentions, shares and the WOM which is expected as the ROI for the whole integrated effort put in. If your SEO focuses only on the search engine aspects like some SEOs did in mid 2000 by focusing on link building only to be attacked by the Penguin update later and you have to restart backwards by putting effort to remove all the links that you built. This reminds me of the snakes and ladders game that we played in childhood where the player reaches almost the finish of the game but has to go back all the way because he comes across a snake just one square before the finish box. Today it is not only about search engines but also about users who have become more tech savvy and the consumer attention which is getting fragmented with digital channels proliferating, with people having access to devices and the internet on the go 24x7x365. The ability of being constantly connected has made the decision making process directly dependant on the UGC and WOM generated on networking sites by. A user relies more on what his fan, follower, friend or a person in his circle has to say rather than what the website owner has claimed on his website. Hence the content on your website and the content generated on the various social media platforms by your customers, employees, etc. has to be in sync. for the company credibility to be established which in the long run adds to the trust factor. SEO ensures the ability of the web presence to get indexed and crawled and get correlated to the targeted search queries. The quality of the content defines the ability of the content being shared further on social media which in the long run establishes the thought leadership and the trust factor. Good quality SEO may get the site page 1 rankings for the targeted keywords but conversions may be a challenge without gaining the trust factor which is an offshoot of the semantic web. Search engines either integrate web standards like XML sitemaps, Schemas, Meta tags,etc. or they create their own standards like the Google created the Authorship Markup. As an SEO we have to tune and tweak the websites as per the search engine preferences but also focus on the standard procedures specified by the WWW and as an SEO process make the site immune to all the algo changes by focusing on the user and the WWW as a whole.